James Davis walking up the stairs to his log cabin. In the front his wife Patsy's grave. James Davis is 73 years old. 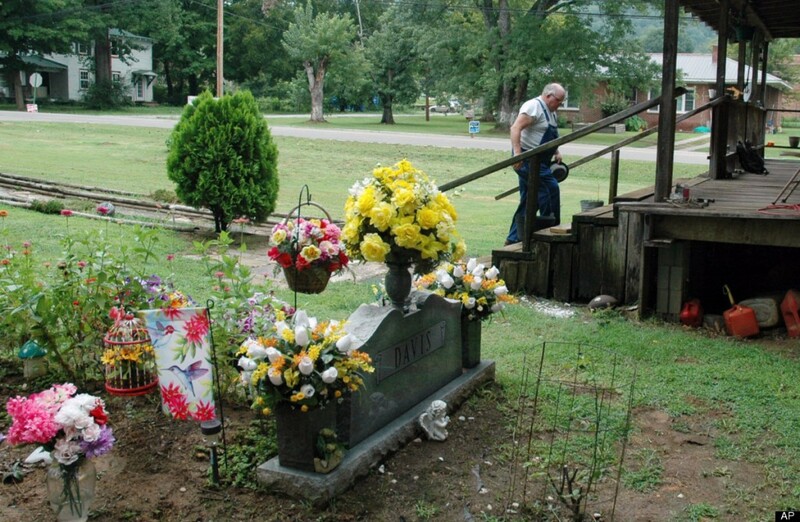 When his wife Patsy died in 2009, he buried her at her own request, in front of the log cabin he had built himself and where they had lived their lives together in the city of Stevenson, Alabama. He buried her well. She lies in a vault and casket, marked by a marble stone, the plot covered with colorful flowers. Now the city of Stevenson wants him to move her. The grave, it is argued, is illegal. Neighbors may complain. Who knows, maybe house prices will be affected. We cannot have that! A bond of $10,000 has been set by a judge as a condition to stop initiating action to remove her body. Surely, the burial of people needs to be regulated in some way, but as always when the law inserts itself into our most intimate and emotional relationships, it can often seem heartless. As a child I remember my father’s outrage at a photograph depicting how a Romani man in Sweden was retained by police who hindered him from placing a bottle of vodka in the casket of his own father. The contours of this black and white photograph are engraved in my memory as an image of a kind of ultimate oppression. The act of hindering a human being from the right to mourn and honor their dead in their own way is inhumane. To physically restrain a man from honoring his father the way he was taught and the way he felt was right, seemed so unreasonable. The Swedish photograph from the 1970s, and the story of James Davis both depict the collision of traditional cultures with modernity. While they are small scale events in the personal lives of individuals, they carry a larger message that should concern us all. Both are stories about how administrative red tape and principles can be used to hurt and humiliate people. To tell them: we cannot accommodate your grief, your needs or your sorrow, because they do not fit our standards. And what does not fit our standards has to stop. I wonder how often individuals given the authority to step in, simply decide to let it slip through the cracks. How often do they “lose” the complaint against the old man who buried his wife by his house, or “forget” to hinder that man slipping a bottle of booze to his dad? I wonder, because those acts of letting be – despite the rules and regulations, are sometimes what makes us truly humane. Win, Lose, Tie! Raiders Fan ‘Til the Day I Die! Earlier this summer, one of my students, Haley Bryant, alerted me to this clip about sport funerals. Yes, such things do exist. Our dearly departed American sports fans find ways to bring the passion of their lives, the sport they love and the team they call theirs, to their grave. Meet the Die Hard Cowboys Fan who was buried in full regalia (except for her shoes, because “they don’t bury people with shoes on, who knew?”). Meet the Steelers Fan whose dead body was displayed at the memorial service in a recliner, covered by his favorite fan blanket, in front of a game on TV. Meet Big George whose ashes were given a spin on the nascar track and allegedly called out from the great beyond. Sports funerals are not just about emotions. They are also a business, or service, depending on how you look at it. Major League baseball teams have licensed caskets and urns that can be purchased by their fans as a final proof of loyalty and devotion. But it can go further than that. In 2009 the Aggie Field of Honor was inaugurated at College Station, TX, as a resting place for fans of the college football team. The positioning of the dead, aligning to face the stadium (should they ever rise up) is no less formal than the directions that for centuries have structured the burials of Christians and Muslims in their orientation toward the holy cities of Jerusalem and Mecca. You know what they say: In Texas Football is God. But beyond the first impression of hilarity and absurdity, the clip also conveys something deeper. More than anything it shows the care, warmth and respect that people show their loved ones in death. It also translates how our rituals reflect more than just death. They mirror fragments of our lives – like concentrated capsules that can contain not only our beliefs about life after death, because “you never know” if you can play sports in heaven as the Cubs fan states in the clip. They can also reflect our dreams, our ideals, our passions, our relationships and our identities. And they change with the world around us and the culture, to accommodate new needs as they emerge. And after all, you never know.